Dr. William H. Robertson is an Associate Professor in the Teacher Education Department in the College of Education at the University of Texas, El Paso. His academic areas of expertise are in science education, curriculum development and technology integration in the K-12 levels. Additionally, he develops, researches and teaches materials related to problem-based learning and action science. Dr. Robertson was a recipient of the 2009 University of Texas Regents’ Outstanding Teaching Award for Tenure-Track Faculty and in 2008, Dr. Robertson was selected as a Fulbright US Scholar and worked in Santiago, Chile at the Universidad Metropolitana de Ciencia de la Educación (UMCE) in the department of Physics. Previous to coming to UTEP, Dr. Robertson was an employee at Los Alamos National Laboratory (LANL). Dr. Robertson completed his Ph.D. in Multicultural Teacher and Childhood Education with an emphasis in science and technology at the University of New Mexico in 2000. He has also obtained a Master's degree Science Education from the University of Colorado – Boulder, a BA degree in Spanish from UTEP, a BS in Biology from Northern Arizona, a BA degree in History from Duke University. 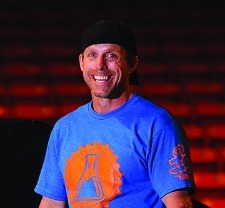 A long time participant and performer in skateboarding with over 35 years in the sport, Dr. Robertson has developed Dr. Skateboard’s Action Science (http://www.drskateboard.com), which addresses physical science concepts for middle school students utilizing skateboarding and bicycle motocross (BMX).